The Northern New Jersey Community Foundation’s ArtsBergen initiative kicks-off 2017 with a new Connect the Dots networking series. The first event, Connect, Collaborate & Create, will be held on Wednesday, January 25, 2017 at Fairleigh Dickinson University’s Student Union Building, the Rutherford Room, located at 1000 River Road in Teaneck, New Jersey, from 6:00 p.m.to 8:00 p.m. Refreshments will be served. Now, in its second year, Connect the Dots is a free networking series drawing people throughout Bergen County. Members of the arts community, municipal and community leaders and business owners living or working in the county are invited to attend and meet others with similar interests, share their creative endeavors, and build partnerships for arts based community projects. Michael Bias, the founder and Artistic/Producing Director of The Garage Theatre, will facilitate the session in fun “get-to-know-you” exercises that create opportunities for artists to make substantive connections and share their work. “Creativity doesn’t happen in isolation. One of ArtsBergen’s goals is to provide opportunities for artists, arts organizations, and community leaders to network. These connections can spark creative, artistic ideas and partnerships that can cultivate arts based projects in the community,” said Danielle De Laurentis, Associate Director of the nonprofit Northern New Jersey Community Foundation based in Englewood, New Jersey. During 2017, the focus of the Connect the Dots series is to connect and strengthen the vibrant arts community in the region. With more artists living in Bergen County than the rest of New Jersey, a goal of the series is to provide opportunities to collaborate, encourage partnerships among artists in the community, and explore and develop creative placemaking projects in the area. During January, the NNJCF’s Community Engagement Program is partnering with Bergen Volunteer Medical Initiative (BVMI), a nonprofit based in Hackensack, New Jersey providing healthcare to uninsured residents, to collect and provide dental products to underresourced residents in the county. 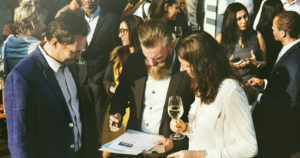 People attending the Connect the Dots event are asked to bring dental products, such as toothbrushes, toothpaste, dental floss, mouthwash and other dental related items to the networking event. The dental products collected will be distributed to the BVMI’s patients. Space is limited. Pre-registration is required for the first Connect the Dots event and may be done online. For further information, call 201-568-5608 or send an email.